HOLLYWOOD, Md. 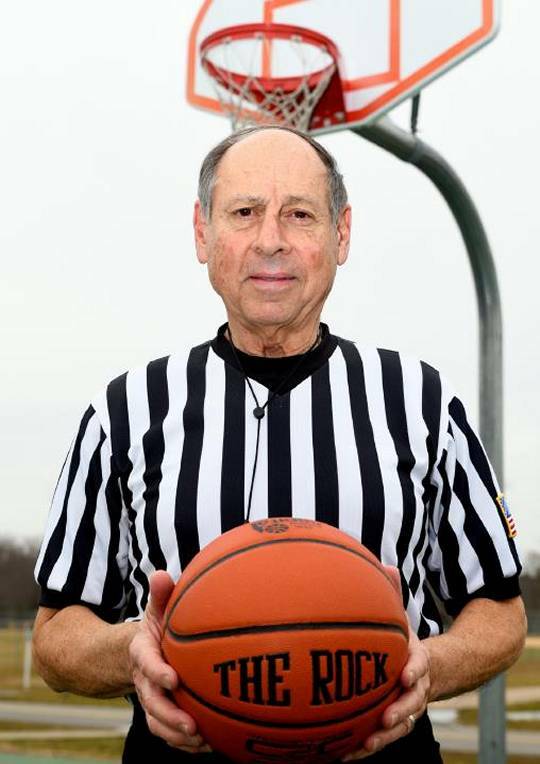 (February 28, 2019)—Gene Pellillo can remember when he and two other referees were officiating a college basketball game in which there were just seconds left on the clock. When one of the teams attempted their last shot at the basket, they claimed a foul kept them from winning the game. The referees called the game to a close. "We headed towards the locker room and all the students ran out onto the court," Pellillo told The County Times. "We got to the locker room and it was supposed to be locked; it wasn't." Life as a basketball referee can be just as intense for them as it is for the athletes on the court, Pellillo, 74, said. Later that night he had to restrain a fan who had attended the game from punching another official in the parking lot, he said. "We were told they were an aggressive school," Pellillo said. Pellillo, a Great Mills resident, refereed college level basketball from 1985 to 2011, officiating games throughout the region and the country with the Capitol Athletic Conference. He also refereed for the Old Dominion Athletic Conference and the West Virginia Intercollegiate Athletic Conference. He's seen court drama from players and coaches and seen great athletes at work. Growing up in Fairmont, West Virginia, he earned a degree in physical education and eventually took a job as a gym teacher at Leonardtown Middle School; this was in 1966. 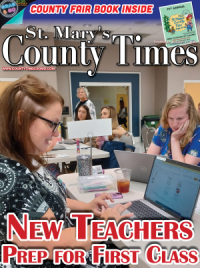 "I'd never heard of St. Mary's County, " Pellillo said. "But they were all very friendly, they just welcomed me." He quickly got involved in local community sports that were the social glue of the county; in his off time he would open up the gym at the middle school and let neighborhood children come in and play. He soon got the attention of Al Barthelme, who was then the head of the county's recreation and parks department; he wanted Pellillo to start officiating basketball games for small children. "I started doing that for $5 a game," Pellillo said. "Teacher pay back then was just $8,000 a year." He also became a member of what would eventually be called the TriCounty Sports Officials Association, which refereed all kinds of sports in the region from football, softball and volleyball to basketball. He would also come to be a member of the Maryland Basketball Officials Association. "Almost every bar had a softball field," Pellillo said. "It was big in those days." 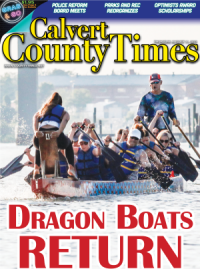 Sports and officiating games became such a passion for him that he continued to do it even when he joined the St. Mary's County Sheriff's Office in 1972 where he also saw plenty of action; he was involved in the investigation into a gruesome triple homicide and even traded gunfire with a kidnapper on Three Notch Road in one case, he said. He rose to the rank of lieutenant and even took over as acting sheriff for a time when the position became vacant. "I'd always wanted to be a police officer," Pellillo said. By 1984 Pellillo went to an officials' camp held by J. Dallas Shirley, an NCAA and Olympic qualified referee who recruited referees every year to oversee college games. Pellillo didn't quite make the cut the first time out but he made it the next year. "He'd record you and see what you were doing out on the court," Pellillo said. "He'd tell you 'You've got to move to get a better view of the gameplay,' "He taught you how to handle coaches and players." The life of a basketball official is an exacting one; they have to constantly learn their craft, be aware of the rules of the game and be able to stay in shape to keep up with some of the best, fastest and strongest athletes in the country. "It's to teach you to handle yourself on the court," Pellillo said of his training. "You show no favoritism." Pellillo has officiated NCAA championship games in Division III and regular games in Division II and has even seen county level talent, such as Jim Paxson, who used to play at Leonard Hall in Leonardtown, move on to the big leagues. "I could tell he had the best fundamentals at between 12 and 13 years old that Id ever seen," Pellillo said. "He went on to play for the NBA." When Pellillo took to the court to officiate a college game, he always had to be at the top of his game, even after often traveling hours just to get to an arena. Referees have to maintain a high level of awareness, professionalism and even athleticism to execute their duties in high stakes games, he said. "You've got to use your training and you've got to use your experience," Pellillo said. "You've got to get your adrenaline running; no mistakes, you want to be on top of every play. "You don't walk along the court, you run." Still, nobody's perfect. Even with all their training and experience, referees make mistakes. "Sometimes you have to admit you missed a call," Pellillo said. "I've never seen any referee make it 100 percent." Innovations such as instant replay of a game in a recording are helpful at times, he said, but it also can hamper a game. "It takes the flow out of the game," Pellillo said. "When it's going good, you don't want to stop it." Criticism comes from coaches, players and fans but most people really don't know what a foul is on the court and what is not. "Most people don't know unless you're an official," Pellillo said. "On a travel call, you have to know where the pivot foot is. "When you've got a player using a wall defense around the net and another player comes into contact with him when the defense player has his arms raised some people call that a charge, it's not [in college games.]" Pellillo has been retired for about eight years now but he doesn't look his age and still fits into his official's jersey easily; he misses his time on the court. "I enjoyed officiating, I couldn't wait to get out onto the court," Pellillo said. "It's like another lifestyle out there on the court. "I miss the game, the camaraderie between the officials."